Email marketing is a proven way to build strong relationships with both existing and prospective customers in order to grow brand awareness and generate more revenue. Convert new customers and drive repeat sales with a bespoke email design tailored to your brand. 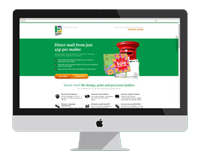 Our design team will create an inspiring email design that is optimised to achieve high open and click-through rates. Our developers will then craft the design into a reusable email template that can be used with a variety of email marketing platforms. An email marketing platform should be chosen with the desired results, and of course your budget, in mind. After assessing your target audience and your desired outcomes, our team will advise on the best value option that will achieve your aims and objectives as well as deliver a worthwhile return on investment. We host your system, taking away the burden of software, hardware and skills requirements, meaning you can focus on the essence of email marketing – communicating with your customers. Alternatively we can work with you to deliver a self-hosted solution. This may be beneficial where you already have the necessary skills and resources in place. Focus on running your business and know that your email marketing is in good hands. Everything from email design, content creation and database management to campaign delivery, evaluation and reporting. We can help with a specific aspect of your email marketing or we can tailor a comprehensive solution unique to your business. By taking the time to understand who your customers are and what motivates them to make a decision, an email marketing plan puts you in good stead to get the most from your campaign. Whether you have a modest database of 250 people or a collection of 100,000, Badger Press help you unlock the full potential of email marketing. Please contact us today to find out which email marketing solution is best for you.